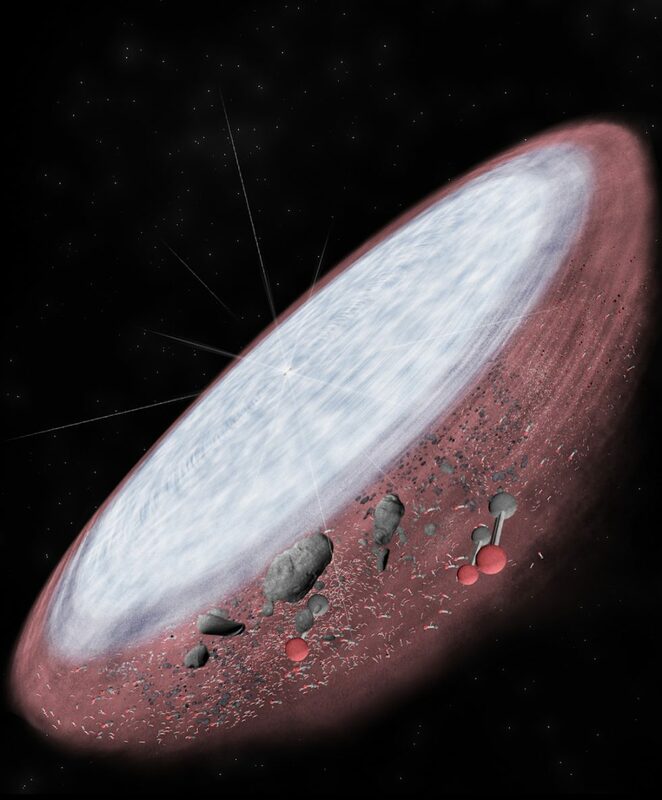 How do we know what’s going on in protoplanetary disks? Visible light telescopes don’t reveal much, because the thick dust obscures their view. Luckily, each kind of molecule in a protoplanetary disk broadcast at unique sets of wavelengths that can be detected by radio telescopes. How do molecules broadcast their presence to us? When molecules collide or react, they emit energy in the form of light. But molecules naturally emit radio waves on their own, based on their temperature and the arrangement of their protons and electrons. The quantum structure of each molecule determines the very precise wavelength of light or set of wavelengths that each kind of molecule can emit. Scientists refer to these sets of wavelengths as spectra—a molecule’s signature. And we can test it back on Earth in the lab. So when we tune our radio telescopes to the far reaches of our galaxy, we know what we’re looking for. Viewing protoplanetary disks involves a collaborative effort between telescopes that specialize in different functions. The National Science Foundation’s Green Bank Telescope, which sees longer wavelengths, can figure out where matter is concentrated. The Very Large Array can see large dust particles, which makes the VLA good for observing the inner portion of disks where molecules are most abundant. For example, silicon monoxide, the most abundant building block of rock on Earth, emits at a 7-millimeter wavelength, which is long enough to be picked up by the VLA. ALMA detects shorter wavelengths, making it the best instrument for viewing the overall structure of the disks. Infrared telescopes observe the surface of the disks, or their “atmosphere,” amongst other things. Putting all these pieces together gives us the most complete picture. Each molecule in a disk essentially operates as a teeny radio broadcast antenna. Just like radio stations on Earth, some molecules broadcast at higher power or frequency than others. The molecules with the strongest signals have what’s known as a dipole moment. A dipole moment is an electromagnetic field that’s oriented along one axis, like a bar magnet. Having that one preferred magnetic orientation focuses the signal’s energy. Molecules with strong dipole moments are easiest to detect. It would make sense that the most abundant molecules in the protoplanetary disk would be the easiest to study. However, this isn’t quite the case. Molecular Hydrogen (designated as H2), by far the most abundant molecule in interstellar space and protoplanetary disks, is inert. H2molecules only knock into each other about once every two weeks, and when they do, they make a weak, infrared signal. The next most abundant atoms in protoplanetary disks are carbon, nitrogen, and oxygen. Carbon and oxygen win in that mixture, combining into carbon monoxide. Carbon monoxide has a dipole moment, and since it broadcasts at 3 millimeters, 1.5 millimeters, and shorter wavelengths, ALMA can detect it and study it. So, this deadly poison is valuable to astronomers from a safe distance of light years away. Astronomers have just taken advantage of carbon monoxide’s properties to make a significant advancement—they have gone beyond inferring planets, from gaps in the dust, to actually detecting their presence. Two teams of astronomers looked closely at carbon monoxide signal data from ALMA. Because of the Doppler effect, the light’s wavelengths shift slightly, depending on the gas’s motion relative to Earth. This property lets astronomers observe the gas’s velocity. Now, Kepler’s laws of planetary motion dictate the exact way that gas should be rotating around a star. Just as a skater spins faster when they tuck their arms in, the gas closest to the star spins faster than the gas further out. It’s a nice, orderly pattern. ALMA’s spectacular resolution enabled astronomers to make very precise measurements of the velocity of CO around a young star 330 light-years away. They discovered three anomalies in the expected pattern, places where gas was rotating faster or slower than its surrounding gas. These deviations could only be caused by Jupiter-mass planets! The researchers next checked their findings with computer simulations—as in, what would happen to a disk of rotating gas if we stuck planets in there. The models spit out a picture so identical to the researchers’ observations that they couldn’t believe it. ALMA has delivered us a window to watch the birth of planets. Astronomers will keep sharpening the ability of this new method to provide us with more information. They will use it on other stars, and may even come back with clues to how our own solar system came to be. Many thanks to NRAO astronomer Al Wootten for his contribution toward this article and blog series. Next week, I’ll sit down with Al and ask him about what scientists have learned about protoplanetary disks during the course of his career.